Pearls? Did somebody say pearls? Fond thanks to Deja Pseu, who told us about her new pearl necklace on her wonderful blog... so here's more on my favourite gem. Picking Fab Fakes: Do As Pseu! With her characteristic great eye, Deja Pseu scored a striking necklace, above. Pseu's have interest through varied size and generous length. She can wear it as two strands (above), knot it, or wear one long strand flapper-style. Her Gerard Darel piece is composed of big baroques (I'm gonna guess 16mm to 20mm) with tiny pearl stations between some links. The chain makes the baroques "float" for a lighter, more modern feel. No pearl in nature (outside the crown jewels) grows to a 30mm perfect round. Have fun with your oversized "pearls" or audaciously styled strands, infinitely more interesting than sweet, perfect white 8mm beads. Shown above, from Miriam Haskell's Legacy Collection: 16" necklace of glass pearls with a Swarovski glass crystal placed slightly to the left (the smart detail); $200. Don't kid yourself that "you can't tell the difference", though. Fakes are usually too lustrous and perfect, so there's something soulless about them; they're all surface. I have two costume strands: a long rope of giant pale gold gumballs on heavy "gold" chain, and Majorica 14mm "Tahitians" which I packed for business travel. They're pretty, but like wearing silk versus poly, fakes feel different. If strung in the classic way, avoid "stringing" that is done with tiny beads between each pearl instead of a knot; they won't swing gracefully. Look for a good solid clasp and snag-free, substantial findings. 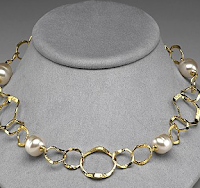 One modern option: 18" Majorica gold tone necklace with hammered links and baroque pearls, available from Bloomingdale's, $210. 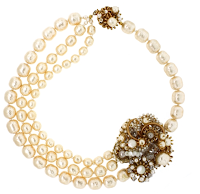 Miriam Haskell's romantic three-row Pearl Statement necklace, with Swarovski crystals and European findings, was inspired by one of their vintage designs. On sale for $434, (reduced from $620) in the Sale section of the web site. Funky, chunky fakes aside, I love real pearls and look for large, high-quality Chinese freshwaters in rounds, baroques (my favourite), keshis, sticks, and coins, perfect for casual wear. When I resist a few costume pieces, I can afford genuine pearls, if not a strand of luxe South Seas. Look for character, iridescence (or orient), and charisma. There is a certain almost breathing essence to a lovely pearl. (Many) Pearls are surprisingly reasonable. This month's special at Pearl Paradise is a Tin Cup Necklace of Tahitian baroque pearls with peacock overtones, on silver chain, for $185. Check Pearl Paradise's monthly specials, and act quickly if smitten. eBay seller DruzyDesign (Carolyn Ehret), known for her unusual pearls, is currently listing this glowing strand of 8-8.5mm natural coloured pearls (no dye), the current price is $9.99, with several days to go. Yes, you still have to have them strung, but here is an example of what you might buy for the price of a large pizza. Or buy one perfect pearl and wear it all the time. Shown left, Zara Scoville's stunning 14mm South Sea pearl pendants on gold chain. Contact Zara for price (which varies depending on the pearl) through her web site, Priceless Imperfection. I'm saving for a piece. Will declaring that bring it closer? Or choose one exquisite pearl inlaid with diamonds: Erica Molinari 18k Gold Sea Pearl Drop Necklace with Diamonds from Fragments, $850. You can step on a pearl and it will not crush. 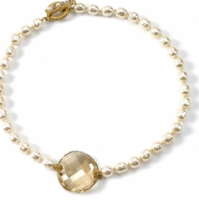 You can restyle a strand by mixing your pearls with other stones, changing the design or making the necklace into a bracelet. If you want extreme long-wear, buy freshwater, which are almost all nacre (the coating the oyster lays down around the implanted bead or piece of tissue). Pearls are worry-free (with the same care you'd give your favourite jacket). Worry about wear and tear? Store them in a pouch so they don't bang up against other metal-set pieces, and keep perfume away from them. If strung on silk, restring every other year. One shouldn't layer pearls with chains, but I do sometimes, because I don't own any Akoyas, which can have notoriously thin nacre these days, and I like that look. I'd feel more vulnerable wearing branded jewelery like Tiffany or Gucci. I guess if one is really fearful, it's plastic all the way. Le Duc once bought me an extravagant pair of sunglasses. When I protested that I'd only lose them, he said, "No, you won't; you'll know where they are all the time." He was right. Don't let "what ifs" get in the way of enjoyment of such a glorious gift from nature. Fake or fine, heaped or a single pearl, how can I resist this glorious bounty from the oyster? I love freshwater pearls as they are beautiful yet relatively cheap. I have some gorgeous dirty pearls strung in a very modern manner which get heaps of compliments. Thanks, Duchesse! When our spending moratorium is over, I'll either pick up that Zara necklace I love, or purchase some of those loose baroque pearls and see if I can find someone to do something similar. I loved your comment, and agree with it 100%: Don't let "what ifs" get in the way of enjoyment of such a glorious gift from nature. Pseu, you and I can go up to Zara! She's in Washington Park and I've been in touch! Thanks for the tip, Duchesse. I'm pilfering from my kids' piggy banks weekly, I figure in six months I can buy the Calder earrings.